Most of the images will be of the cards I got from Pictlogica Final Fantasy as there’s a collaboration going on right now between the two games. ^^ As usual, I’ll write a little bit more on certain screenshots under the gallery. Uugggh. Discovered the use for cards map monsters drop and now I’m going around collecting this particular creature to upgrade the ability of my Lakshmi/Laxmi card. If I’m not going to use any Revival Tickets for Lakshmi/Laxmi, then I’m going to need 19 more of these 3-star Grudge Rangers. The paaaaiiinnn …. I have yet to figure out what the heck determines how many enemies the attack hits. In this case, only the center and 2 on the right were affected. The Samurai’s special skill/deathblow is pretty neat as it bestows a few buffs after using it. There was a bit of lag between battles 1 & 2 and the camera rotated to this point which is pretty rare. ^^ Usually, you just see his profile. Like in the normal difficulty of chapter 2 of the side story map, Pagan Heads drop a lot more jewels than other bosses. This event is more like infinite grind. .___. Wal’s ability is Earthbind. it will hit one enemy and may delay its turn. Garland’s ability is Wheel of Flame. It can only hit a single target but it may also reduce its attack power. I’m still wondering if she even has hands. Echo’s ability raises defense for a few turns. Princess Sarah’s ability is Proud Storm. It’s a wind attack that can hit all enemies and also may delay their turn. There are 12 cards with really adorable illustrations. ^^~! Unfortunately, it’s possible to get duplicates. 😡 Given that they come with their abilities maxed out, having duplicates are pointless. Yuna’s ability is Ray of Hope. It restores health. Notice it only needs 1 health orb to activate~! All the Pictlogica cards give increases of 1% to some stats. This one also provides the increased chance to obtain health/recovery orbs. Even with the wimpy 1% increases, the level 28 4-star Yuna Pictlogica card ups attack and magic power more than the maxed out 3-star Yuna card. Spotted a player with this and decided to give it a go. Garnet’s card ups attack and Break power for a duration of time. Squall’s ability is Rough Divide. It’s an Earth-based attack that can hit one enemy. 1% up for HP, Attack, Break, and Magic Power. This was a questionnaire designed to allow players to provide feedback to the Mobius FF team about their play habits, what they want to see added to the game, and some other stuff. It’s also a collaboration with Unity Technologies Japan; every player that submits a completed survey will receive a redemption code to have Unity-chan as a familiar. Regarding the snapshot of a battle in progress and the caption that begins with “I have yet to figure out …”: I’m referring to Lakshmi/Laxmi’s skill which is an area-of-effect attack. I can’t figure out why only the smaller enemies to the left of the center monster got hit. (I wrote “right” in the caption because they’re near the right side of the screen.) I don’t expect it to reach all of them but I would have figured the one immediately to its right would have gotten nicked. There’s an event called Infinite Arena going on right now which ends on the 31st of this month. The whole gimmick is to replay the coliseum multiple times to collect a certain quantity of an item that’s required to unlock the paths around the map. A few locks ask for 400 of them. =__= I never counted how many were needed in total but another player said that it was over 2,000. I feel the designers were lazy in coming up with a creative way to go about the event. (They also really love locks.) Is the concept of “infinite arena” in reference to the necessity of continually going back to it to grind for the item? There’s also the whole thing about the map and coliseum being related to the 三闘神 (the Warring Triad from FFVI) somehow. The west is belongs to the Goddess, and I’m guessing 魔神 is Demon. He’s to the south. The east is where the Fiend (鬼神) should be hanging around. I’m going to be disappointed if we can’t fight the bosses once everything is unlocked. >:| I cleared the west side already and there was no Goddess there! … Isn’t the Goddess traditionally in the center between the other two? Ah, the collaboration with Pictlogica Final Fantasy. 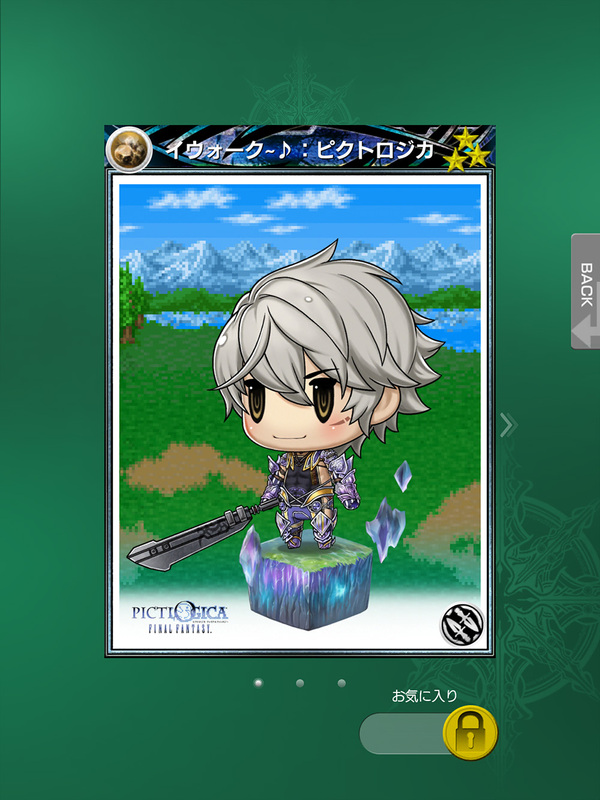 The illustrations are so cute but that gacha is just like any other gacha; you’re bound to get duplicates. I only tried 3 times and drew Yuna first and then 2 Squalls. 😛 I stopped afterward because I wanted to save up some tickets for the next multi-card promotion. I’m sure some of the Pictlogica cards from the random draw could be useful but I’m not certain Square Enix will ever let us evolve them to 4-star or beyond. Oh yeah, getting the event quests to show up in Pictlogica was a strange ordeal. Hmm .. I should have taken a screenshot of 8-bit Wal. I don’t have the character but I did come across others that did. Oh well. I was so happy that Raid Boss was one of the options for question 6 which asked players to express what they wanted to see added into the game. I pretty much checked off everything except player versus player. ^^ I’m not all that into the PvP stuff.